Like many young women, before I got married I often thought about what my future husband would be like. I knew I wanted to marry someone who was smart, kind, and thoughtful, someone who would make a great father some day, and someone who wasn’t afraid to work. Luckily, the man I married did meet all my expectations, except for one: he was terrible with his money; the very definition of a big spender. He was so good at spending that when I met him right before the recession, he was knee-deep in credit card and consumer debt and underwater in his mortgage. He was at his lowest, financially speaking, and it was tough watching him navigate his way through the painful financial situation he had created for himself. After we married a few years later, I knew my efforts at living a frugal lifestyle to save money would be futile if I didn’t get my husband on board with a financial plan, but I also feared that I was facing an uphill battle in getting him to be more responsible with our newly shared finances. I wasn’t, however, willing to sit around and watch while the same mistakes were repeated, and I sure didn’t want to work until I died to support spending habits that left us with nothing in our golden years, so I took action to get us on a better path. 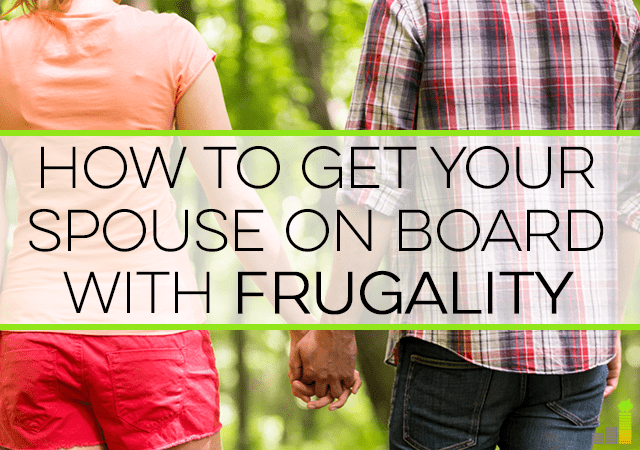 Here are my best tips on how to get your spouse on board with frugality. First of all, nagging never works…ever. If you preach to your spouse every day about their spending, they’re going to resent you for it, and your sage message of a financially secure future will fall on deaf ears. Nagging gets you nowhere; I know from experience. So if you tend to nag, hold your tongue and instead try a different approach. If your spouse has no desire to take the financial reins, then absolutely become the financial head of your household. Ask your spouse to save receipts so that you can balance the checkbook. Organize and file all the important parts of your financial picture so that it’s all in one secure place. Set up an account on Mint.com or Personal Capital to help highlight your net worth, household spending patterns and your financial goals. If your spouse ever shows an interest in any of it, then great! Answer every question they have, but don’t force it on them. They’ll come around when they’re ready. In our house, the word “budget” used to be a four letter word, and I know a lot of other people feel that way, too. Budgeting sounds restrictive to those who have never done it before, even if you know the opposite to be true. Because my husband felt completely restricted anytime I even mentioned the word “budget,” I knew I had to stop. That approach just scared him away, so I had to come up with a different strategy to get him on board with saving money. I had to encourage him to embrace frugality by planting a seed that would get his attention in a different way, and any idea containing the word “budget” wasn’t going to work. What ultimately turned my husband around for good was the first time I suggested we track our spending for one month. Since I started small with only one month, it didn’t seem like too much to ask, so he agreed. I also reassured him that I wouldn’t question or judge any expense he listed, which was key, because I wanted him to be truthful about his spending. So for one month, he carried a little notebook in his pocket and recorded every expense he made, even the most trivial of purchases. Fortunately, that simple act resulted in his own realization of his excessive spending, and I didn’t have to say another word. Since he recorded his own transactions, he couldn’t hide from them. He saw how much he was spending at Lowe’s, how much it cost him to eat out at lunch every day, and how much he was spending on Golden Tee for a single month, and it was eye-opening for him. He was horrified. Hello, breakthrough! This single event was years ago, yet he still talks about how it reformed his thinking about his spending. My last tip is to create a common financial goal to share with your spouse. Choose a goal you both would love, such as saving for a trip to the Caribbean or a new couch. It doesn’t really matter what it is, as long as it’s a shared interest. Make a spending plan or designate a savings account just for that goal, save for it every month, and see how your spouse feels when you finally reach your goal. It may seem elementary to you, but if you have a spouse who doesn’t care about blowing money, then it may be just what you need to jump-start your path to a shared financial future where you are both working towards the same goals. No one can change overnight, so expect progress to come one tiny, precious baby step at a time. Today, my husband laments about how much money he blew in the past. He talks about all the real estate we could own or the early retirement we could be enjoying right now if he had been smarter with his money before. It’s not always fun to reflect on those realizations, but I remind him that at least he came around eventually. You have to learn in your own time. If your significant other doesn’t care about your financial future, don’t give up yet. It probably took you some time to start caring about your money, so you can’t expect your spouse to jump in headfirst with you today. But keep at it. 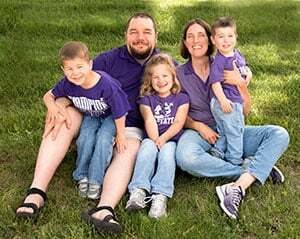 My marriage is a great example of what can happen, because we are now working together towards financial independence with our marriage still (happily) intact. Did you marry a frugal person? If you’re not currently married, would you marry someone who wasn’t frugal or who was deep in debt? How do you and your significant other handle your finances together? When I met my partner I still had a bit of my debt to pay off, and he was debt free and very good with his finances. We have combined finances now which I manage. Luckily, we are on the same page with our financial goals! My wife and I had many talks about money when we first met. I told her what my goals were and that this was how I needed to reach them. She said she understood, but there was definitely a lot of tension in the early days. I found that the best way for us to get on the same page was a combination of two things. 2. Track our spending together and review at the end of each month. As part of the review, we would need to figure out the number of work hours we spent to pay for each category, the amount of freedom a 4% withdrawal rate would have granted had we invested instead, and then deciding whether we received a worthy amount of happiness considering these two things. These two steps have helped us align our values much more than in the beginning when I just quoted Mr. Money Mustache constantly. I used to quote Mr. Money Mustache too, and it got me nowhere! Too funny. Me and my husband both weren’t good with money until within the past year or so. Due to a series of dumb moves and sheer bad luck, we were starting to sink financially. I think he just got paralyzed and didn’t take any action. He didn’t know what to do. I used the opportunity to learn to manage money better. He’s still not as motivated as me to learn about all this stuff, so he is usually just following my lead for now. It’s okay for you to take the reins then! I bet he’ll come around in time. Sometimes it’s hard to know where to start and it seems easier to do nothing. 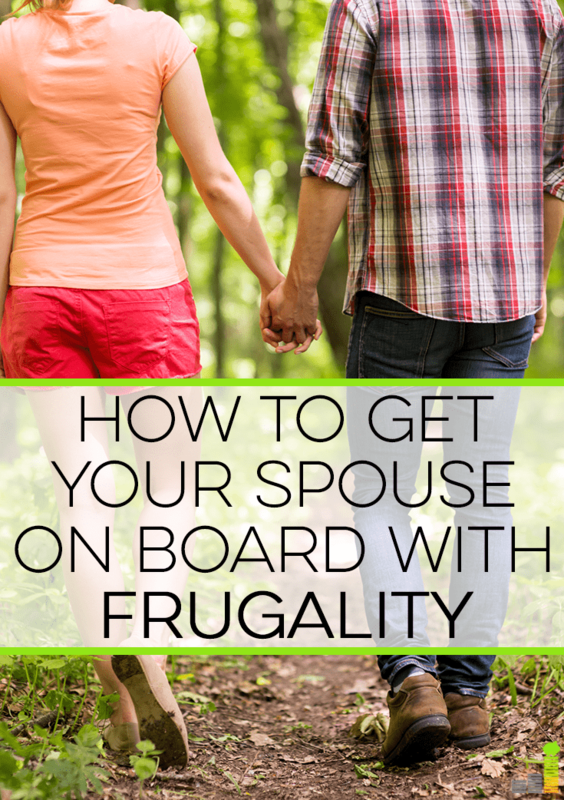 My husband was always the frugal one, and I was the spender. Not crazy spending, just not as frugal as he was, and I definitely someone who let lifestyle inflation creep in. Blogging about money helped. I started writing investment pieces but got much more interested in frugal living. Now I would say there are some things I focus on (expense tracking, paying off the mortgage faster, improving cash flow) and some things he is still more focused on (grocery costs, money saving DIY). It’s great that you both have financial awareness, though, because a lot of couples lack that. I’m a saver but my wife is more of a spender, but not so much that it really creates problems. I’d have to maybe classify her as a saver/spender. We rarely have major issues with money. You guys are pretty lucky in that department! Luckily, my wife and I have always been on the same page when it comes to money. We have been frugal individuals since we were young. We practically grew up together. We were high school and college classmates and she’s been my best friend ever since high school. Having said those things above, there are expenses that may seem to be too high for us. What we always do is sit down and assess if we really need to buy such expensive products. 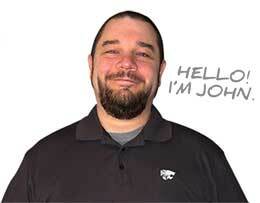 It is through open communication that we are able to determine if such products are really necessity or simply wants. That’s awesome that you guys work together so well. Both my wife and I are on the frugal side, although she’s probably a bit more of a spender than I am these days. But we work together to create and review our budget, track our spending, and make progress on our financial goals. I think it’s very important to get on the same page financially as your spouse, but as you said it doesn’t always happen overnight. You’ve outlined a great process to help that happen. You know, you make a great point about being the example. You can’t force someone to change but they are much more likely to get on board if they see you living a frugal lifestyle. I also can attest to the fact that our money management and being on the same page with finances has greatly improved since we started tracking our monthly income and expenses. Thanks, DC! I think starting to track your expenses is a game changer for a lot of people. I really like your point about having a common goal – that seems to be the key. If both of us have a true desire to reach that goal we can better align around wanted to be disciplined with our finances. That doesn’t mean it is always easy!